Maha Gaida, 31, who speaks four Indian languages -- Hindi, Urdu, Malayalam and Tamil -- participated in the grand finale of the "Bharat Ko Janiye" quiz and became emotionally overwhelmed while describing her relationship with India. A Tunisian woman's professed love for India moved foreign minister Sushma Swaraj Tuesday, prompting her to say that she must have been "an Indian in her previous life". "Tunisia and India, both have a very special place in my heart. And, I am delighted to be part of this event, and excited to explore India more. I wish to thank Sushma ji for this opportunity," she said. Maha, who participated in the foreigner category, later while interacting with reporters said this was her fourth visit to India, but first shot at the quiz contest. 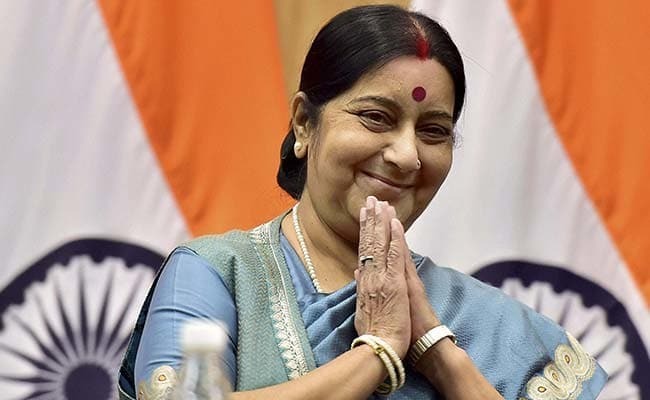 Her professed love for India, charmed Ms Swaraj, who in her address at the event held at the Pravasi Bharatiya Kendra in New Delhi, said, "Among all the events organised by the MEA, the quiz is the dearest to me." "Maha has been very excited about her visit and was getting overwhelmed answering each of the question which shows she came well-prepared. But, what is the most striking part is her love for India," she said. "Maha, you must have been an Indian in your previous life... we in India believe that (previous life). And, it is that love for India which is manifesting in your eyes and words spoken," Ms Swaraj said, drawing applause from the audience. During the felicitation ceremony, Maha greeted Ms Swaraj by touching her feet on the dais and the minister reciprocated by hugging her. A senior Ministry of External Affairs official said 24 contestants were selected for the semi-final, which took place on Sunday, from over 40,000 applications drawn from over 100 countries. From 24 semi-finalists, nine were chosen for the grand finale in three categories -- NRI, PIO and foreigner. An emotionally overwhelmed Maha, during her interaction with reporters, said she learned Kathakali dance in Kerala during her visit to India a few years ago. "I love Bollywood films, but I also love south Indian language films. Indian films are not just Bollywood. I like Shah Rukh Khan but also Vijay from Tamil films and others," she said. Maha, who is from Sousse city in Tunisia, said she watches film on internet which helped her pick up Hindi. Her younger sister, Soha, a fashion designer, who also participated in the quiz event, said, "We watch films on TV with French subtitles." Maha said both India and Tunisia had several similarities like spicy food, scenic locales and cultural roots celebrated in both the countries. "I am deeply in love with India and it is my heart," she extolled.